Manila, Philippines – For once in a lifetime the orphans and disabled persons would be the special guests in one of the biggest UHF channels in the country in its anniversary. 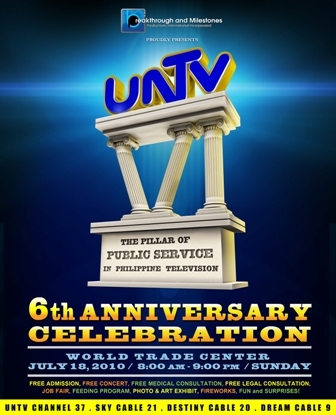 UNTV is set with their 6th year celebration on July 18, 2010 at the World Trade Center. Very much different from the usual grand celebration of major networks during their anniversaries, UNTV prefers this year’s anniversary to be low-key but beneficial for the needy fellowmen. Thus its theme “UNTV, Pillar of Public Service in the Philippine Television” fits the event. Some of the charitable projects that were lined up in the event are free legal consultation, free blood typing, job fair, mass bloodletting, and medical services. As special guests for the event, the orphans and the disabled will be treated with feeding program, amusement rides, and games and prizes in the World trade Center, Pasay City. UNTV’s Daniel Razon opted to open all his resources for helping the neglected in society, something he had been doing way back even before he became known in broadcast industry. The network’s CEO zeroes in public service aside from broadcasting. The six years of UNTV already brought recognition from commendable organizations that support public service projects. Razon would like to make sure that the less fortunate will be privileged on this day. To do so, the network will be attending to their needs. Aside from the charitable services from the public service network, UNTV will also honor the country’s “unsung heroes” – the broadcasters, through the portion “The Essence of Test Broadcast: Recognition of Broadcasters and other Media People”. One of the network’s featured broadcaster and spiritual leader is Bro. Eli Soriano of Ang Dating Daan and is expected to grace the event on the eve of celebration. UNTV has been the “home” of Ang Dating Daan in the free channel sphere for many years now. Razon always credits Soriano, presiding minister of Members Church of God International (MCGI), as his influence for doing his humanitarian projects. The country’s first free transient home came out from the aspiration of Bro. Eli to help the homeless and the destitute. Transient home is just one of the many charity services that MCGI continuously operates in cooperation with UNTV. The anniversary celebration will be open to all who wish to be part of this event. It will start from 8 AM until 9 PM.